As a child growing up in New York, the month of December was always a time that I would feel within a tinge of collective jealousy. Seeing the dazzling, colorful array of lights and decorations that many houses displayed so prominently in honor of Christmas often left me crestfallen and convinced that the Jewish people were gypped because the Channukah candles seemed just so…wimpy. Even those that would get more creative and hang up a multi-colored “Happy Hannukah!” sign, trying to liven things up a bit, or the truly adventurous families that would really go all out and actually hang up a machete dreidel with a smiley face…didn’t quite match the excitement and aesthetic allure that shined from the surrounding houses’ walls and rooftops covered with lights, sleighs, and other fascinating decorations. Why then just a few measly candles? If this holiday’s commemoration was to insure our survival in exile, why did He not leave us with a real bang, a really exciting, eye-opening, show-stopping, loud, lively and sparkling display of lights and colors and heat? But we need to stare deeply at the resounding elegance of the candles to see it and hear their message. All the power and vigor needed to surmount any challenge is conveyed and displayed in the deceptively small flames of the Channukah candles. They might not be apparent immediately; one needs to listen to what the candles are whispering. For their message is too profound to be accessible without effort. 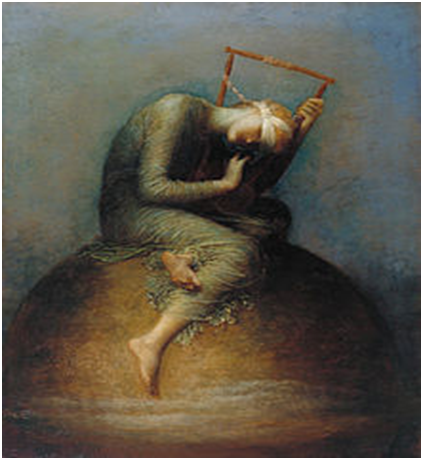 "With her clothes in rags, her body scarred and bruised and bleeding, her harp all but destroyed and with only one string left, she had the audacity to make music... To take the one string you have left and to have the audacity to hope… that's the real word God will have us hear… from Watt's painting,"
"Hope need not mean expectancy. It suggests here rather the music which can come from the remaining chord". What an extraordinarily powerful message! Hope need not mean expectancy. To hope is simply to grab tightly that last string and play on. No matter what. Keep making the music even though one is certain that the future shall not yield any real positivity. It is the music itself, the hope for better, that is the end itself, and not just the means to reach a rosier reality. That is the audacity of hope. Living with a vision of a better tomorrow, utterly inspired by that vision, letting its melody carry you, while knowing full well that the pictured tomorrow shall probably never arrive. “It is the place where one’s will and thoughts are directed that is the true location of a person”. That is the hauntingly inspiring and surprisingly audacious music of hope. It is beautiful music; it is transforming music. Hope allows one found in the most despondent situation to be lifted up, to transcend the bitter reality within which one might be trapped, to see new vistas of a Promised Land, shimmering with an expansive aura of goodness, serenity, and peace, totally independent of actual empirical circumstances. I think that is why the great singers of the human condition, Isaiah, Shakespeare, and Dickinson all compared hope to a bird. A “mean creature” caught in a “sore storm” that Chesterton would have termed desolate despair can soar and fly out with the swift, mighty wings of hope that “never grow weary… not be faint.” Hold dear that last string of hope! Pluck at it with your whole being and allow that music to reshape your internal landscape, though you know that the external one might never get better… "Hope need not mean expectancy. It suggests…rather the music which can come from the remaining chord". Because it’s the music, the hope itself, regardless of any actual outcome, that will make present reality smile and enchant. At the same time that Watts was painting, there lived in Russia an intensely passionate, mystical rabbi, Rabbi Shalom DovBer Schneerson of Lubavitch. He was not content with this understanding of hope. He declared hope to be much more daring. For since the beginning of the world men have not… perceived by the ear, neither hath the eye seen… what He hath prepared for him that waiteth for Him. To hope is not just to picture with no expectancy a permanently elusive state. Judaism exhorts us to hope, but not a hope that is only a wistful dream, a fantasy that might serve to raise one out of despondency though quite possibly lacking any eventual fruition. We hope...with expectancy. To hope is really to await. Because our hopes grow out of a trust in God. We hope with expectancy because we do wait for Him, and therefore know to expect a better future. Do you understand that this is why no storm has ever silenced the bird of Jewish hope? Throughout the centuries, the song of Jewish hope was sung during pogroms, crusades, and even in concentration camps. Because we do expect. And wait. And trust. And therefore never, ever stop hoping. That things will actually change and get better. Nothing the Jews faced caused us to stop plucking at the one string left on the harp. And the little, forlorn bottle of oil that the Maccabees found... was that one remaining string of the harp. It proved that hope should truly be expectancy. The priests in the Temple lit the menorah with it, they had the utter audacity of Jewish hope and dared to play a melody with the small, solitary string...and it indeed burned for eight days. And the candles are still today whispering that secret, telling us to hope for and expect the impossible. But their message is not only the inspiration to continue “to take the one string you have left and to have the audacity to hope.” The Channukah candles are also explaining to us how we can do it- how in the face of any sorrow or adversity, we can so persistently “never stop - at all-” living with the trust and hope for the concrete actualization of better times. There are many scientific opinions about the nature of hope. From where in the soul does it come? Which aspect of the psyche allows a vulnerable, tender victim of fate to refuse to surrender to the challenges it's facing and continuously retain the yearning for a better life? Some claim hope to be an emotion, others consider it a state of mind. In truth, neither is correct. The mighty pinions of ascending hope are manifestations of the inherent essence of the soul, the candle of God, His lover with an unquenchable passion for Him, ever striving to fuse with Him. As a flame perpetually rises, refusing to yield to any force that tries to bind it, the soul is constantly trying to soar up to its Beloved, the source of all positivity and goodness, the Infinite Light of God. Expectant hope results from the soul’s essential, innate striving towards God taking the specific form of a confident lens through which to evaluate and perceive reality. Far from the world we know, up where the clear winds blow. The graceful persistence of the Channukah flames are demonstrating and reminding us that the soul’s constant love and yearning for God can indeed lift us up from the harrowing, vanquishing, hurtful world we know to the place of winds of clarity and serenity, the place where the soul belongs, His embrace. Hope is the soul’s wings. The sun is rising now... Near a green forest, is a wide field, where a bird walks around. What sort of bird is this? What sort of bird is this? With yellow feet, and a pearl-whi​te beak, he is waiting to go home. With yellow feet, and blue-gree​n wings, he is waiting to go home. Wait,​ birdy, wait! Wait, birdy, wait! Until​ God decides it is the right time, then you will go home. But when will it be? But when will it be? When "The Temple is rebuilt and then the city of Zion will be filled" - that is when it will be.